Please join us for our third annual Grape Stomp and Harvest Festival! We will have a grape stomp competition, Wear Your Whites contest (bridal gowns and white suites,etc), and an I Love Lucy Look-a-Like judging. The afternoon will be filled with entertainment and a hog roast from Cen-Tex Chefs Collaborative! We expect this event to sell out…so don’t wait to buy your tickets, or you may end up squeaky clean and disappointed. Proceeds from the event go to support the growth of Salado Montessori, a new non-profit Primary for kiddos ages 3-6. Salado Montessori aims to inspire a love of learning in each child and follow the child’s interests throughout their pre-school years. The Cen-Tex Chefs Collaborative will be on site selling delicious hog roast and handcrafted sides and sauces. Our wines will pair perfectly with the fine swine available. We’ll be serving our locally made wines by the glass and bottle. There is no admission fee to attend. Our pre-sale ticket packages ensure you will reserve your souvenir t-shirt. 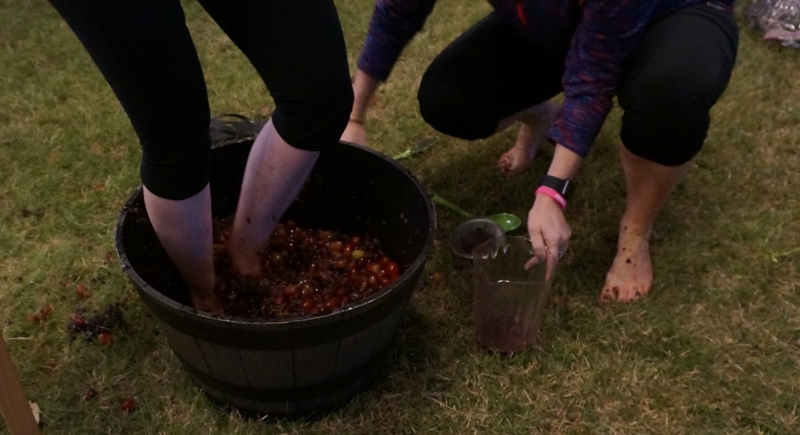 Our grape stomp will be the ideal opportunity to make your Instagram followers super jealous. Teams of two will compete every 15 minutes in rounds of 4-5 teams. During your team’s turn, one person will stomp for two minutes and then the second person will stomp for two minutes. The team of two who produces the most juice wins bragging rights! Pay attention, this year the packages are different. We are now offering our Dionysus Package, which gains you the right to pose in the giant vat of crushed grapes and then make your own wine-footprint t-shirts. If you want to to compete, the Smash Those Grapes Package is the one for you! Tickets are refundable up to 7 days before the event. After that, you may transfer your ticket to a friend – make sure you email the ticket to your friend. The show will go on even if it rains, snows, sleets or whatever the great state of Texas comes up with for weather. This event will be outdoors and everything will be under a tent. Kids are welcome and Winerycat insists that dogs must be on a leash. NO outside alcohol may be brought in. That means you cannot bring beer, wine, distilled spirits or moonshine. Please no sneaking in alcohol…this is not your high school prom, thank you! Fans of all ages are welcomed to the harvest festival. Stomping will commence when the Stomp Master blows the whistle and all teams must stop stomping and collecting at the closing whistle. Any team who starts early or delays stopping will receive a penalty. All stomping must be done with bare feet. Stompers may hold on to their team member for support. Only juice will be measured. Any grapes and pulp will be strained out by the judges. In the event of a tie, the officials will choose the team who displayed the least abandon. Any team not participating in a manner consistent with fair play and good sportsmanship is subject to disqualification without refund. If you break something, you’ve bought it. Your slot will be during the hour you sign up for. You must be on time. If you are not present when your team is called, then you forfeit your team’s grape stompin’ tickets. All participants must sign Liability Waiver. Under 21? This ticket includes one t-shirt, a photo op in the grapes and one juice box, soda or water. The “ummm, I’ll just watch….” This ticket includes a t-shirt for your footprints, a photo op in the grapes, and one glass of wine. 21 and over, only. Ticket holder is entitled to one go at stomping, one glass of wine, a t-shirt for your foot prints and a photo op in the grapes. When you purchase your ticket, let us know the name of anyone you’d like to compete with so we can pair you together! 21 and over, only. We are looking for artisan toys, foods and home remedies, Montessori-in-the-home items, jewelry & art vendors who reflect the spirit of Montessori education. For we anticipate 120 Grape Stompers, 200 spectators and 15-20 vendors. We hope to exhibit high-quality, educational or unusual items that are not commercially available. We especially welcome wood toys, Montessori in the home materials such as kids aprons, organic foods and home remedies, handmade home items such as baskets and boxes, unique jewelry and so on. We will only accept handmade items. We are not interested in t-shirts or accessories made in factories, no matter how cool they are. A 10′ x 10′ spot on the grass is $100. You can bring your own tent/canopy or not. Electricity is available for $10. A table and chair are available to rent for $10. Festival t-shirts are available for $15. 8/21/2018 – Final deadline to pay & submit forms. 8/22/2018 – Grape Stomping from 4-8, all booths set up & vendors ready to sell at 2. Load in: September 22 from 9AM – 2PM. No vehicle traffic allowed during the Grape Stomp. To be considered as a vendor, please follow the link below and fill out the application. We will review your submission, and accept/deny your application. Once accepted we will email you a bill. In order to be included in our map and on our t-shirt, you must submit the completed form and payment by September 21, 2018. Please upload a photo representative of what you sell. It may be used in our promotions. We reserve the right to reject vendors, especially if we feel the proposed vendor does not fit with our theme, or there are already too many vendors in the same category. We want our vendors to be successful and want our festival attendees to have a varied experience! The form will automatically take you to a payment dialogue. Vendor fees are refundable until September 15, 2018.